Are you tired of having IPS patches that only work on headered ROMs, or only on non-headered ROMs? Don’t you wish it could be either-or? Well, now with Headerizer, it can be. Just specify the patch you want to alter and presto! 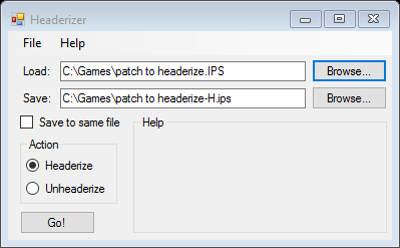 You can “headerize” a patch designed for non-headered ROMs in order to create a patch for your headered ROM, or you can go the opposite direction.